(Q.no: 1-5). Refer to the following Line Graph and answer the given questions. The number of students who could pass the exam in the year 2016 were 20% more than that in the previous year. Only 50% of those who appeared in the year 2016 could pass the exam that year. How many students appeared for the exam in the year 2016? Number of students who had passed the exam in the year 2012 are what percent less than that in the year 2013? What percent of students who appeared for the exam in the year 2012 could pass the exam? 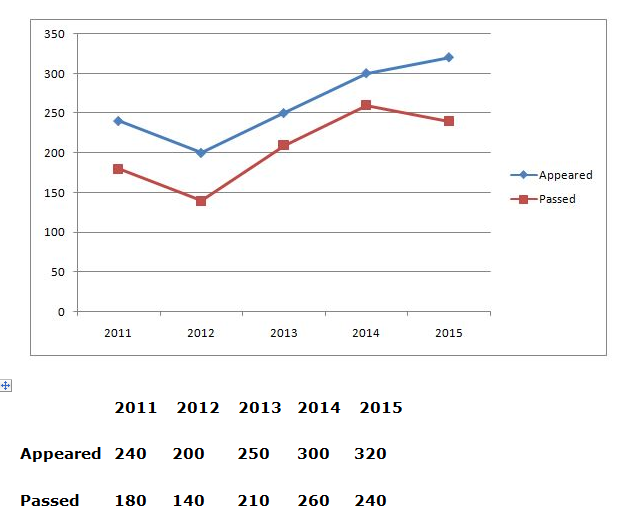 What is the respective ratio of total number of students who appeared for the exam in the years 2013 and 2014 together and the total number of students who could pass the exam in the same years together? What is the average number of students who appeared for the exam in all the years together? Sharmi spends 23% of an amount of money on an insurance policy, 33% on food, 19% on children’s education and 16% on recreation. She deposits the remaining amount of Rs. 522 in bank. How much total amount did she spend on food and insurance policy together? A fruit seller earns a profit of 20% by selling a basket containing 80 Mangoes whose cost is Rs.240 but he gives half of it to his friend at cost price and sells the remaining Mangoes. In order to earn the same profit, at what price must he sell each Mango? An amount of money is to be distributed among A, B and C in the ratio of 7:4:5 respectively. If the total share of A and C is 4 times the share of B, what is definitely B’s share?